Aircraft force landed on a road. 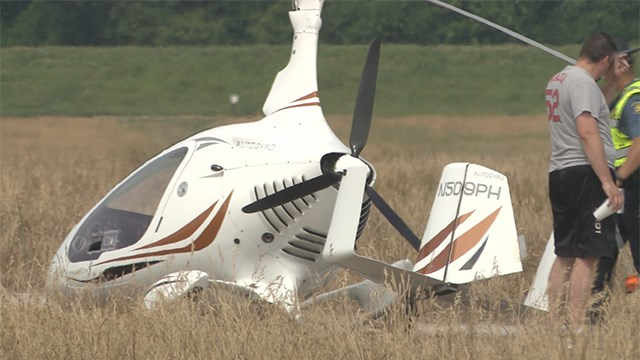 A gyrocopter crashed near Spirit of St. Louis Airport in Chesterfield on Sunday morning. Authorities say the crash happened just after 9 a.m., and that everyone was able to walk away without significant injuries. It is unknown how many people were in the aircraft at the time of the accident. No other information is available. On June 4, 2017, about 1545 Pacific daylight time a Piper PA28-180, N4871L, collided with the ground in a residential neighborhood in Moorpark, California. The commercial pilot and his 15-year-old son passenger were fatally injured, and the airplane sustained substantial damage. The airplane was being operated by the pilot as a 14 Code of Federal Regulations Part 91 personal flight. The cross-country flight departed Camarillo Airport, Camarillo, California, about 1445. Visual meteorological conditions prevailed, and no flight plan had been filed. 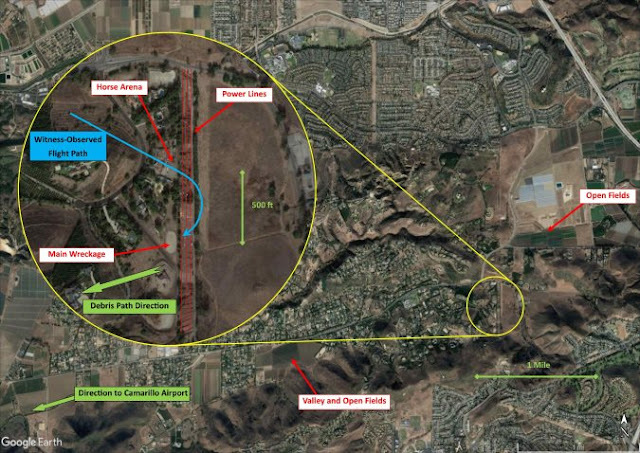 The pilot reported to friends that he planned to fly to Santa Cruz Island (about 40 miles southwest of Camarillo), and then back over an equestrian neighborhood in Moorpark, where his daughter was receiving horse riding lessons. The pilot's daughter was on her horse in an outdoor horse arena, and was accompanied by two riding instructors, one who was at her side, and another in an adjacent wash rack area. Both instructors reported seeing the airplane approach from the northwest and fly over the arena in a southeast direction. They stated that the pilot had flown over the area before, and although they could not definitively judge the airplane's altitude, it was about the same as on those prior occasions. The airplane then began a 180° left turn, tracking back past the arena and to the northwest. The pilot's daughter exclaimed to them that she could see her brother in the front left seat as the airplane passed by. The airplane continued on the same track for about 1/3 of a mile, and as it overflew a house on the top of an adjacent hill it began to turn left. The witnesses reported that the engine started to "sputter," and then stop producing a sound. The airplane continued the turn, until it was now lined up on the original inbound track. The witnesses then heard the engine sound increase, as the airplane flew directly towards the arena, but now at a much lower altitude. The airplane continued to descend with the engine operating, and flew about 100 ft directly overhead, startling the horses. Electrical power transmission lines were situated just to the east of the arena. Prior to reaching the lines, the airplane began a steep right turn, such that the witnesses could see the complete wing profile. One witness stated that the turn and engine sound were reminiscent of an airplane performing aerobatic maneuvers at an airshow. The turn progressed, with the nose pointing up, and then dropping back down, as the airplane passed out of view behind trees. The witnesses then heard two loud thuds, and immediately ran in the direction of the noise. They found the airplane in the center of another sand-covered horse arena, on an adjacent property, about 600 ft to the south of their arena. Another witness, who was located on the accident property, recounted similar observations. He stated that the left turn following the initial pass was very aggressive, and that the engine was operating at that time. As the airplane came in for the second pass, he was shocked at how low it was flying. After overflying the arena, and just above the tree line, the airplane pulled up before reaching the power lines, and immediately rolled aggressively to the right. The airplane came to rest in the middle of the arena, which was 175 ft long and 85 ft wide, and oriented north-south. Both horse arenas were bound to the east by three separate sets of power transmission lines running north-south. The lines were positioned 60, 85, and 180 ft east of the arena edges. The closest two sets of lines were hanging at an elevation of about 65 ft above ground level (agl), with the farthest line about 75 ft agl. The first identified point of impact was a metallic 4-ft-long transfer mark on the closest power line. Fragments of sheet metal were found directly below that mark. 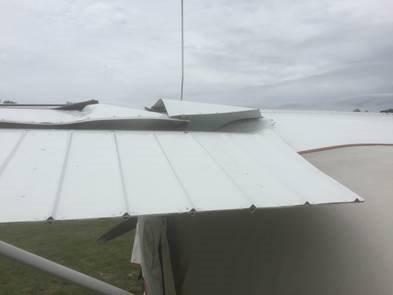 The outboard right wingtip was about 30 ft south of that mark, and exhibited striation damage to the leading edge consistent with power line contact. The airplane came to rest about 120 ft southwest of the initial power line impact location. 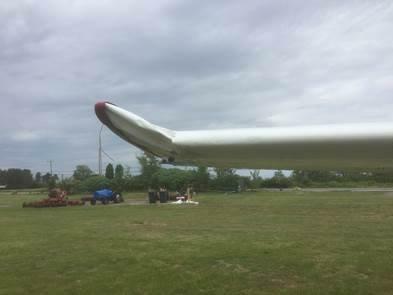 The empennage was largely intact and upright. 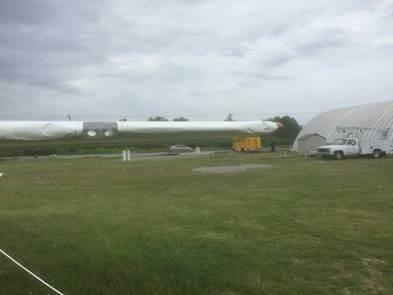 The remaining forward section of the airplane had folded back over the tailcone, and was inverted. The engine, instrument panel, and leading edges of both wings had sustained crush damage. The pilot's son was located in the left seat of the airplane, which according to family members, was not unusual, as he had flown with his father from the left regularly since the age of 13. The airplane was equipped with dual controls. 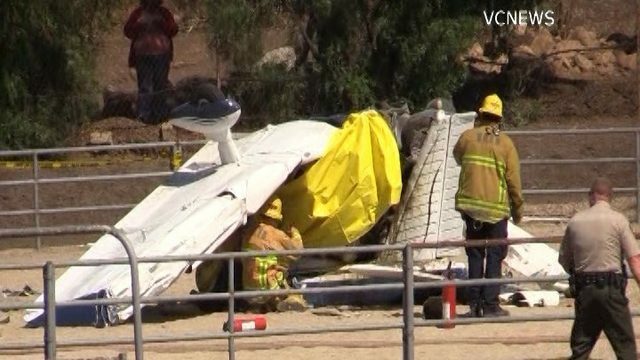 CALABASAS, Calif. (KABC) -- The wife and mother of a Calabasas father and son killed in a single-engine plane crash in Ventura County Sunday confirmed the identities of the two victims. 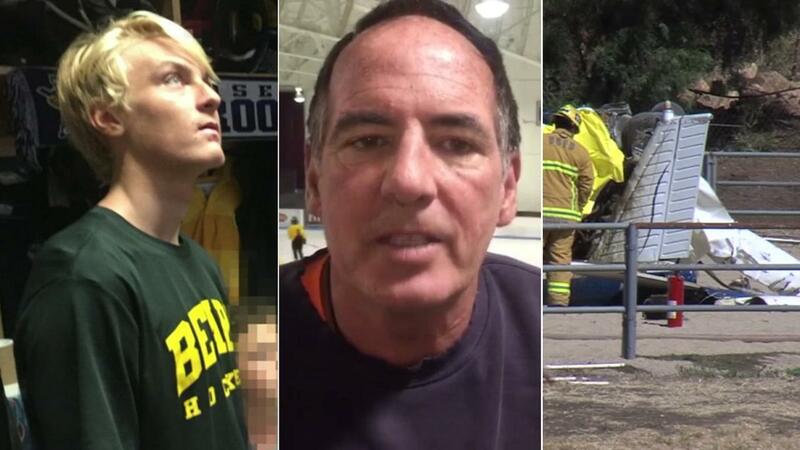 The occupants of the plane were 57-year-old Jim Harlan from Calabasas and his 15-year-old son, Dylan. The coroner also independently released the victims' names. Loved ones say Dylan lived life to the fullest. He was a member of the Burbank Bears Club hockey team, where he had recently made the AAA team. "Plays hockey, surfs, dives, travels the world," said Dylan's hockey coach Peter Torsson. "On the day he died, he surfed in the morning and flew in the afternoon." Dylan had a bright future ahead. According to Torsson, he was well on his way to becoming a student athlete at a Division 1 college. Torsson said he always taught the boys he coached to play like it was their last shift. "I guess it was his last shift," Torsson said of Dylan, through tears. The plane that the two were aboard, described as a single-engine Piper PA-28, crashed around 3:30 p.m. Sunday on private property near the 2700 block of Marvella Court, in an area of Ventura County near Thousand Oaks. Witnesses reported seeing the plane fly low over the area before the crash. The aircraft clipped at least one power line before it crashed into a horse arena, according to authorities. Authorities did not have immediate information on the likely cause of the crash. The FAA and NTSB continue to investigate. A father and son died Sunday afternoon after a small plane they were flying in crashed in the Santa Rosa Valley, according to Ventura County Fire Department. The victims, both from Calabasas, were a 57-year-old man and his 15-year-old son, said Capt. Garo Kuredjian, a spokesman for the Ventura County Sheriff's Office. There were no other occupants on the plane. Authorities were alerted to the crash at 3:30 p.m. along the 2700 block of Marvella Court, near the Norwegian Grade on Moorpark Road. This is the second fatal plane crash in Ventura County in four days. 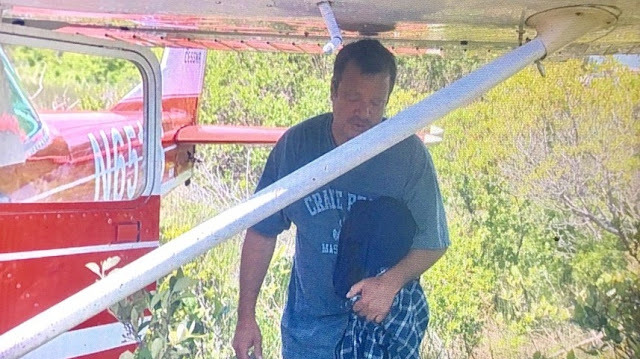 On Thursday, a single-engine Cessna 180 crashed in the hills east of Solimar Beach, killing the pilot later identified as Michael Brannigan, 52, of Lake Sherwood. Authorities said the single-engine Piper PA-28 Cherokee originally took off from the Camarillo Airport. The cause of the crash was under investigation, according to authorities. The plane crashed in a gated community called Hidden Meadow Estates, where properties include large portions of land, many with horse stables. According to Sheriff's officials, most of the airplane landed in the horse arena of a nearby residence. A piece of the wing landed on the other side of a nearby chain-link fence, and a third piece of debris landed about 100 feet away from the crash site, authorities said. Officials from Southern California Edison confirmed one of their power lines had been struck by debris from the crash, causing minor damage. No other structures were reported to be damaged from the incident. Steve Swindle, a fire engineer and spokesman with county fire, said the plane caught on fire after crashing but neighbors quickly extinguished the fire. A neighbor in the area, Gary Blackwell was throwing a graduation party for his son at the time when he said he heard the plane crash. "I saw a plane flying super low," Blackwell said. "I heard it circle once, then twice, and then I heard a gigantic thud." Blackwell said he didn't think much of it until his guests alerted him that they saw the plane go down. Anne Carter, of Camarillo, was flying with her son and saw the plane before it crashed. She said her son had been flying their aircraft at 2,500 feet and she could see the Piper aircraft below them. "I looked down and thought 'What are they doing? They're way too low. It's dangerous. You could crash into houses,'" Carter said. Crews removed the bodies from the aircraft shortly before 8 p.m. Sunday night. They later worked to remove the aircraft from the location. Officials with the Federal Aviation Administration and National Transportation Safety Board are investigating the cause of the crash. The California Highway Patrol also responded to the incident. MOORPARK, Calif. - [Update: 6:15 p.m.] The two males that died in a single-engine plane crash Sunday afternoon in Ventura County were a father and son. 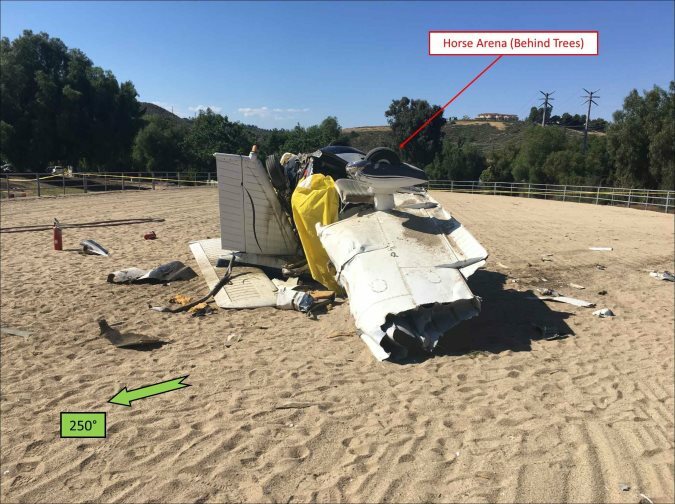 The 57-year-old father was piloting with his 15-year-old son when their plane went down in the Santa Rosa Valley near the towns of Camarillo, Thousand Oaks and Moorpark. The father and son took off from Camarillo Airport. Their destination is unclear at this time. Authorities say the two are both from Calabasas. Their families have been notified. 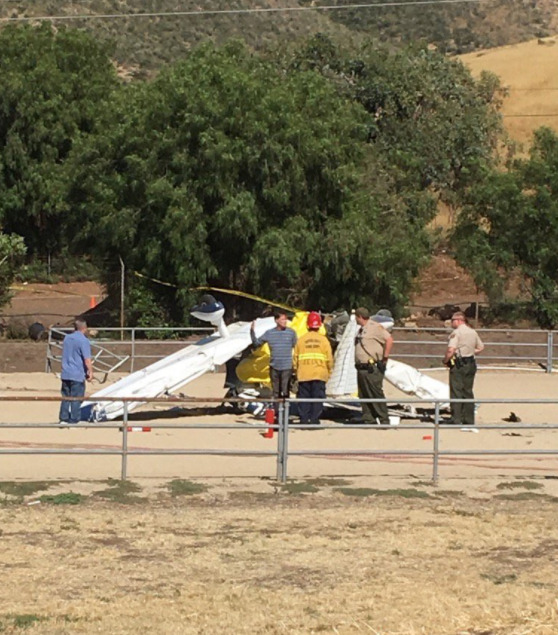 Two men are dead following a plane crash near Moorpark on Sunday afternoon. The small plane went down at around 3:30 p.m. near Marvella Court in the Santa Rosa Valley. The plane, described as a single-engine piper aircraft, crashed inside a horse enclosure on private property. Two male occupants of the plane were pronounced dead at the scene. No one on the ground was injured. Ventura County Fire, Ventura County Sheriff's Office and California Highway Patrol responded to the scene. Fire hose crews were on hand but the crash did not spark a fire. The Federal Aviation Administration and the National Transportation Safety Board have been notified and are en route. This is the second fatal plane crash in Ventura County in less than a week. Two people died after a small plane crashed Sunday in eastern Camarillo, on the edge of the Santa Rosa Valley, firefighters said. Officials responded to a downed aircraft on private property 2700 block of Marvella Court around 4 p.m., according to alerts from the Ventura County Fire Department and California Highway Patrol. 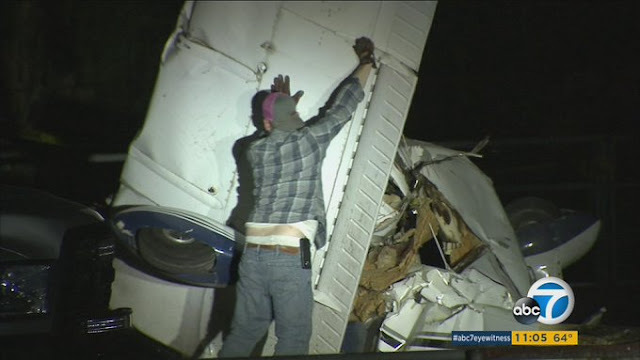 The plane’s two occupants, a 57-year-old father and his 15-year-old son, were dead on arrival, VCFD Capt. Garo Kuredjian said. Kuredjian could not identify the victims except to say they were Calabasas residents. No bystanders on the ground were injured, officials said. It was unclear what led to the crash, which occurred in an open, hilly area behind the Norwegian grade. The Federal Aviation Administration and the National Transportation Safety Board were traveling to the crash scene to investigate the incident. The solo student pilot reported that, during the takeoff roll, the pilot’s side window blew open as full power was applied. He added that he “reached over with [his] right hand to close [the] window,” but as he did so, the airplane veered off the runway to the left into a wooded area and impacted terrain. 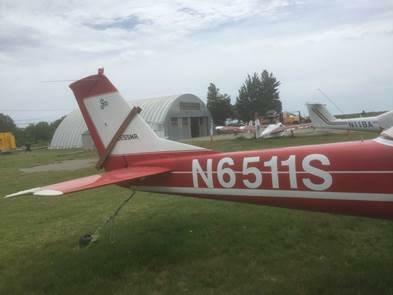 The student pilot reported that he had noticed on previous flights that the window latch was loose and that he had planned to get it fixed but had not done so. Both wings sustained substantial damage. The student pilot's decision to attempt to close the cockpit window during takeoff and his subsequent failure to maintain directional control. The solo student pilot reported that, during the takeoff roll the pilot's side window blew open as full power was applied. He added that he "reached over with [his] right hand to close [the] window," but as he did so, the airplane veered off the runway to the left into a wooded area and impacted terrain. The student pilot reported that he had noticed on previous flights that the window latch was loose, and he had planned to get it fixed, but had not done so. NEWBURYPORT, Mass. (AP) — A small plane crashed into some bushes at the Plum Island airport. The Federal Aviation Administration said a Cessna C150 ran off the end of the runway around 10:45 a.m. Sunday. 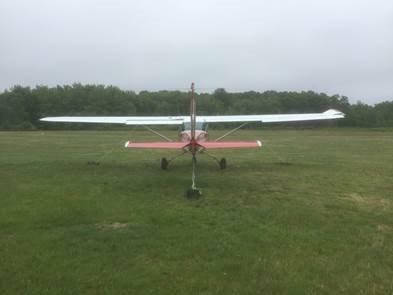 The pilot, Tim Gillette, said he was on his takeoff run at Plum Island Airport when a window popped open. He lost control of the single-engine plane as he tried to close the window, and the plane skidded off the runway, he said. The plane reached about 40 mph and stopped after it crashed into the bushes. Gillette is a student pilot from Ipswich. 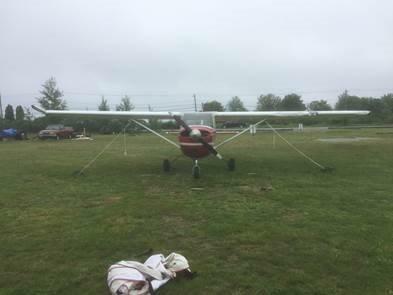 PLUM ISLAND – An Ipswich man was unharmed after a botched takeoff Sunday morning at Plum Island Airport sent his single-engine plane into bushes just off the runway. 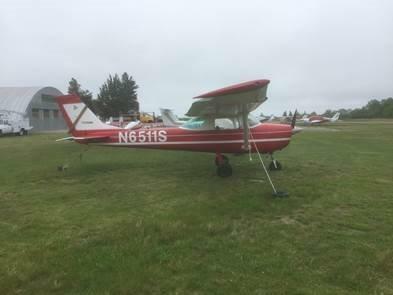 Student pilot Tim Gillette said he was on a takeoff run in his Cessna 150 from the airport's paved runway about 11 a.m. when a window popped open. As Gillette tried to close the window, he lost control of the plane and it skidded off the runway. The plane, with an estimated value of $15,000, had reached about 40 mph and only stopped after striking thick bushes. "The window went open and I lost my focus," Gillette said. Gillette, who was busy sawing away brush in preparation for the plane being towed, said he was fine after the crash. Gillette added that he bought the plane a few months ago and the flight Sunday morning was one of his first flying solo. "I sure learned something today," he said. John Murray, the airport's chief flight instructor, said the runway was closed while emergency responders were at the scene. The airport's grass runway remained open. The airport was expected to feature 10 landings and takeoffs Sunday, according to Murray. NEWBURYPORT, Mass. — A small plane crashed into the bushes at the Plum Island Airport Sunday morning. 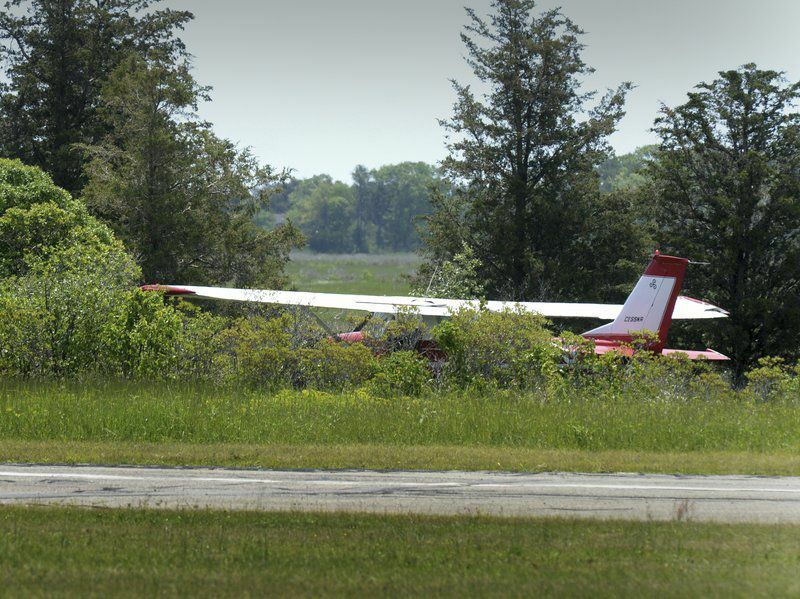 The Federal Aviation Administration said a Cessna C150 ran off the side of the runway in Newburyport at 10:45 a.m. The pilot, identified as Tim Gillette, told WCVB photographer Stanley Forman he was taking off when the window on his door opened. Gillette said he got distracted and ended up in the bushes. No injuries were reported, but the plane did sustain extensive damage. ENGINE- M&M, S/N: Continental O-200A, serial number 61699-5-A; installed since 7/1992. AIRFRAME: As of last annual inspection of Nov. 11, 2016, Tach Time 507.2, AFTT 5498.4. On May 15, 2017, Tach Time is 529.9, AFTT 5521.1. DESCRIPTION OF ACCIDENT: Pilot lost control of the airplane during takeoff roll resulting in the aircraft going off runway and striking shrubs off the runway. DESCRIPTION OF DAMAGES: Damage to both wings, and prop strike, possible hidden damage. REMARKS: Logbooks located with adjuster in Atlanta, GA. Prior written permission required from adjuster for inspection of wreckage. 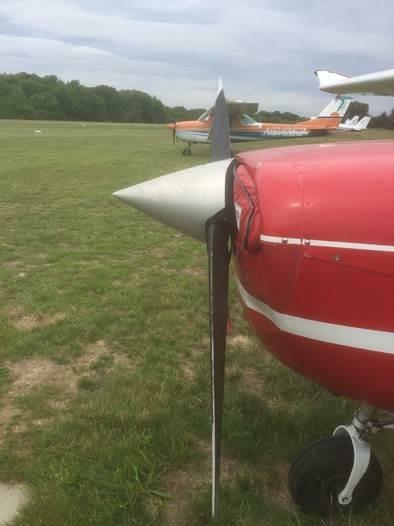 The private pilot reported that, during takeoff for the local personal flight, his seat unexpectedly moved rearward, and the seat back tipped rearward. As the seat slid rearward, the pilot inadvertently applied aft yoke and his feet came off the rudder pedals, which resulted in a loss of directional control. The airplane went off the left side of the runway and struck a ditch, which resulted in substantial damage to the airplane. A postaccident examination of the pilot seat revealed that the forward outboard metal tang on the seat base that retained the base to the track was deformed. The forward outboard position of the base also contained the locking pin mechanism that adjusted the seat fore and aft and locked the seat into position. The deformation of the metal tang likely allowed the seat to become detached from the track and disengaged the locking pin, which allowed the seat to slide rearward. The seat back structure would not lock in any position after the accident. The reason why the seat back could not lock in position could not be determined. The Federal Aviation Administration had previously issued an airworthiness directive (AD), which required repetitive inspections of the seat mechanism, including inspections of the tangs on the seat base. A review of airplane’s maintenance records showed that the inspections had been performed in accordance with the AD. The deformation of the tang was consistent with a lateral deformation due to a sideways force, but it could not be determined if the deformation was present during the most recent inspection. 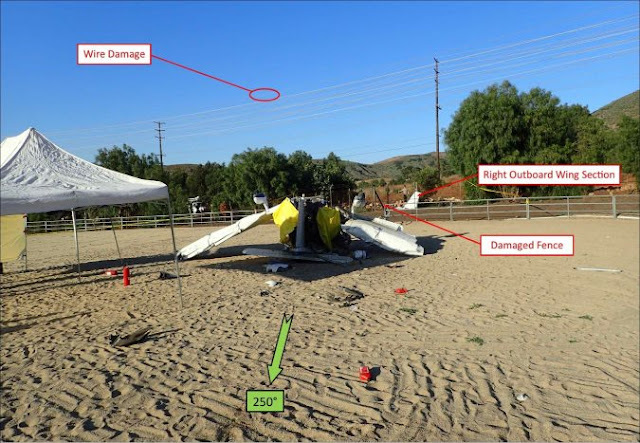 A review of the airplane maintenance discrepancy records showed that, the day before the accident, a different pilot had entered a maintenance discrepancy, which noted that the "left seat slid back three times during flight." 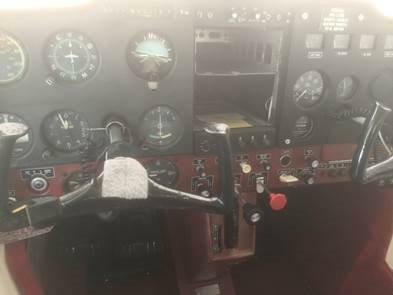 The following day, a mechanic repaired the hold-down spring and returned the airplane to service. After that repair and before the accident flight, another pilot entered a maintenance discrepancy, which noted that the "left front seat was in the reclined position and would not lock in the upright position." The records showed that the discrepancy had not been corrected before the accident flight. It could not be determined whether or not the accident pilot was aware of the previous discrepancy reports. The failure of the seat track mechanism, which led the pilot to inadvertently apply aft yoke and lift his feet off the rudder pedals and resulted in a loss of directional control during takeoff. 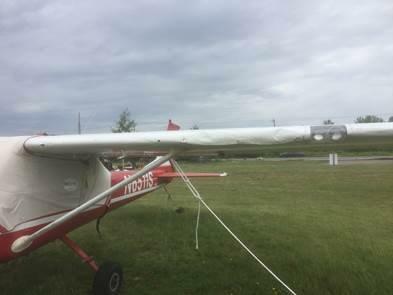 On October 19, 2014, about 1805 eastern daylight time, a Cessna 172K airplane, N79534, was substantially damaged during a loss of control on takeoff at the Greene County-Lewis A. Jackson Regional Airport (I19), near Xenia, Ohio. The pilot, who was the sole occupant, received serious injuries. The aircraft was registered to and operated by MacAir Aviation LLC under the provisions of 14 Code of Federal Regulations Part 91 as a personal flight. Visual meteorological conditions prevailed for the flight, which was not on a flight plan. The local flight was originating at the time of the accident. The pilot reported that during takeoff, about the time that he was rotating for takeoff, the seat unexpectedly slid rearward and the seat back tipped aft. This resulted in his inadvertent application of rearward yoke, his inability to reach the rudder pedals, and the subsequent loss of control. The airplane went off the left side of the runway and struck a ditch bank, resulting in substantial damage to the airplane. Aircraft records showed that on the day before the accident, a different pilot had entered a maintenance discrepancy with a notation that the "left seat slid back three times during flight". On the following day, prior to the accident flight, a mechanic made a repair to the hold-down spring and returned the airplane to service. After that repair and prior to the accident flight another maintenance discrepancy was noted by another different pilot that the "left front seat was in the reclined position and would not lock in the upright position". Records showed that discrepancy had not been corrected before the accident flight. It was undetermined whether or not the accident pilot was aware of those previous discrepancy reports. 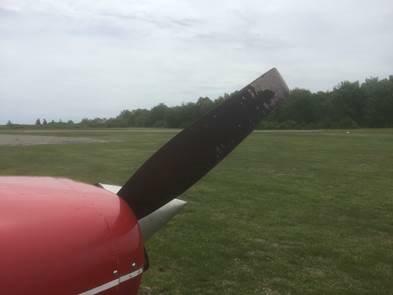 Postaccident examination of the airplane revealed that a metal tang adjacent to the forward outboard seat track roller had deformed. The tang was part of the seat base and the formed lip retained the seat base to the T-shaped seat track. The deformation was consistent with lateral deformation due to a sideways force. It was not possible to determine if the deformation would have been present during the examination required by the AD. The forward outboard position of the base also retained the pin mechanism that allowed for fore-aft adjustment of the seat position. The pin engaged holes in the track to lock the fore/aft position of the seat. Postaccident examination also showed that the pilot's seat back structure could not be locked in any position. No determination was made as to why the seat back would not lock. 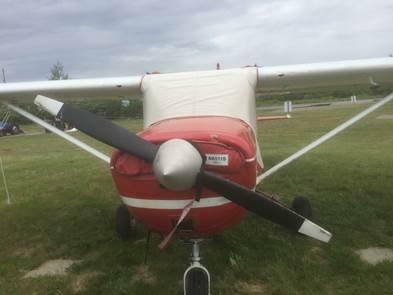 The seat mechanism in the accident airplane was the subject of an Airworthiness Directive (AD) AD 2011-10-09, implemented by the Federal Aviation Administration to prevent seat slippage or the seat roller housing from departing the seat rail. 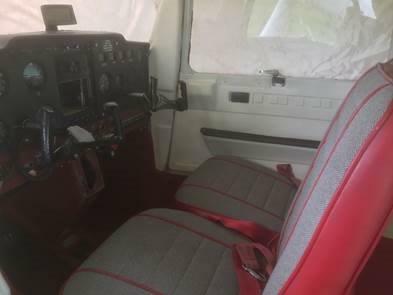 The AD stated that such a failure could cause the pilot/copilot to be unable to reach all the controls and lead to the pilot/copilot losing control of the airplane. The AD instituted repetitive inspections of the seat mechanism to prevent such occurrences. One of the items to be inspected was the tang length from the inner edge of the tang to the outer edge (the bend area) of the roller housing. The AD specified a minimum tang length that would affect the width of the opening between the outer and inner tangs. Review of an airworthiness directive compliance sheet for the accident airplane confirmed that the inspections detailed in the AD had been complied with within the required time frame.